When I began this blog, many years ago, I was not much of a writer. (And still, I am not!) The fun of blogging was new to me, and boy did I have a lot to learn. My first blog was created at Google blogger, but I found that platform difficult to learn. Once I was introduced to WordPress I never looked back. This blog was my first one here at WP. When I started Seashells by Millhill, I knew next to nothing about blogging, or seashells. I had just opened my seashell photography store, and related wedding stationery store. While creating tropical wedding stationery, from my own seashell pictures, I realized that I had finally taken more of an interest in those shells sitting in a bowl. Although I presently live in New Hampshire, I had lived just north of Orlando, Florida for 27 years. My family made many trips to the beautiful Florida beaches and we (the kids mostly) collected a lot of seashells (horseshoe crab skeletons, crab claws, driftwood and coquina) over the years. Most of those treasures from the sea ended up in my outdoor gardens, or decorating my many potted plants. The best and most interesting shells were put into glass bowls. It was just the Florida way. I never gave much thought to seashells. Once I began writing about my seashell collection I had to take a crash course in identifying them. I bought books, read blogs, and searched for pictures, to learn all I could relating to mollusks and the intricate homes they carried with them under the sea. I still learn something new whenever I write about marine life. Along the way I misspelled names of mollusks. The Junonia was one, but I can’t recall what I used to call it. The Lighting Whelk is another. I mistakenly thought it was a “lightning whelk” – like the flash in the sky. So old posts on this blog will name shells incorrectly, and I apologize. Making corrections for all the old posts of years gone by is time-consuming. I work online 7 days a week, usually close to 10 hours a day, so making all those corrections is impossible. Usually when I come across my oldest posts I cringe. The writing is horrible and the posts are too short. Now, many links are bad (thanks Squidoo), so a simple correction becomes a 10 minute chore. Categories and tags were not done correctly, since I didn’t understand how to use them. My reference to Squidoo is because it was the first writing site I joined. I did so to link back to my Zazzle stores. I also linked to those articles from this blog – a lot! Then, Squidoo went away. Articles had to be moved (mine are now at Wizzley), and all links to the site no longer work. So I apologize for that as well. I’m slowly changing the old, bad links, but there are many. Another thing I began doing was to offer free, printable coloring pages. 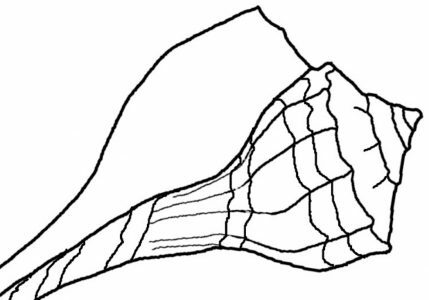 I supplied my own drawings of seashells for anyone to use, just for fun, or homeschool classrooms. Without the exact knowledge to make the pictures the right size, or create a place to store them, that part of this blog fizzled out. There are still some links that work, and you are welcome to use any that you find. It is something I would like to do again (and do it right), but don’t have the time right now. Hopefully in the future I will get my old Coloring Pages article published at Wizzley. I’ve become a better writer with all this practice, but writing is not what I love to do. Usually one day a week I will get the urge to post to my blogs, but most of the time I am creating products for my stores and then promoting the items. It’s my livelihood, so it takes precedence over giving advice on seashell collecting and vacationing on Florida beaches. Thanks to all who visit here and read my articles. Forgive my mistakes and badly written pages, please. I hope you have gained as much knowledge as I have about the seashells we love to collect. Similar with me – oh, I made grammar errors on my posts 😦 Thanks so much for sharing this reflection 🙂 – really like your drawing of nautilus! It’s nice to know I am not alone! My blog is the same. I’ve been going through the oldest posts…correcting…also making all the pictures larger. If only we had known! Live and learn.